Intel and Micron are announcing today that their jointly-developed QLC NAND flash memory is now available, and Micron is now shipping the first solid state drive based on QLC NAND: an enterprise SATA drive branded the 5210 ION series. This will join the TLC-based 5200 family as a lower-cost tier with reduced write performance and endurance. QLC NAND flash memory stores four bits of data per memory cell, providing a 33% capacity boost over three bit per cell TLC NAND, which is now used in almost all SSDs. The downsides are that QLC NAND has lower write endurance on the order of 1000 program/erase cycles, and lower write performance. Both of these are consequences of the difficulty of discriminating between 16 possible voltage levels within a memory cell, as compared to the 8 voltage levels required to store three bits per cell. The cost reduction brought by QLC NAND is a much-awaited advance for enterprise storage. 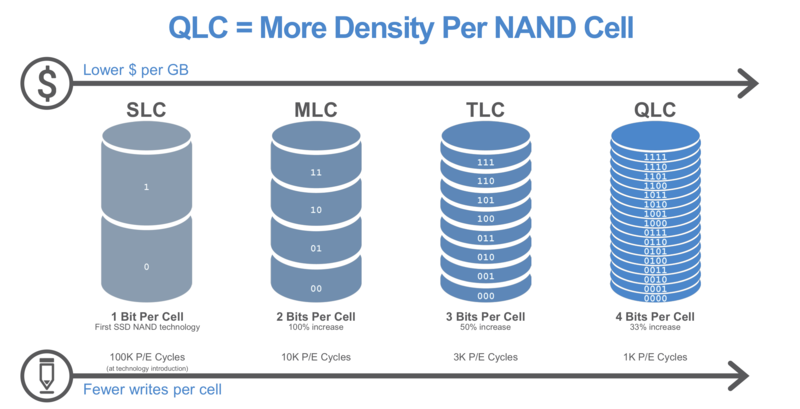 Most NAND flash manufacturers have started sampling QLC NAND within the past year, generally built on the same 64-layer 3D NAND processes that current-generation TLC NAND uses. Micron has previously shown wafers of 512Gb 64-layer QLC when announcing the addition of QLC to their roadmap, but today they are also announcing a 1Tb 64L QLC part—the first 1Tb memory chip to hit commercial availability. That 1Tb part is organized as four planes that can be processing I/O commands in parallel, compared to two planes for previous Intel/Micron NAND parts. This helps offset most of the performance loss associated with increasing per-die capacity. Thanks to the "CMOS under the array" design of Intel/Micron 3D NAND, the extra peripheral circuitry requried by doubling the number of planes doesn't add much to the overall die size. It was initially feared that QLC write endurance would be low enough that drives would need to be treated more or less as write-once, read-many (WORM) devices, requiring careful handling on the software side. With multiple manufacturers now rating their QLC NAND for around 1k P/E cycles, it is clear that QLC-based SSDs aren't too fragile and can handle many existing workloads without needing major software changes to reduce writes. Micron is primarily marketing the 5210 ION SSDs as replacement for hard drives, rather than replacements for any existing tier of enterprise SSD products. In this role, the 5210 ION will have clear advantages in density (with 2-8TB per 2.5" drive) and performance. QLC NAND only provides incremental improvements to cost, so the 5210 ION won't be matching 7200RPM hard drives for price per GB, but 10k RPM drives will probably be feeling the pressure, especially from TCO calculations that take into account the power efficiency advantages of SSDs. Micron isn't providing detailed specifications for the 5210 ION series at this time, but we can read between the lines. The 5210 ION series is based on the same controller and firmware platform used for the 5200 and 5100 families. That means a Marvell 88SS1074 controller, and Micron-written firmware with features like their FlexCapacity configurable overprovisioning to trade capacity for performance and endurance. Specific performance numbers haven't been disclosed, but Micron has indicated that both random and sequential read performance will be comparable to the 5200 family—meaning the 5210 can saturate the SATA link at higher queue depths. Write performance will be lower than the 5200 ECO but still higher than what a hard drive can deliver, especially for random writes. The most important question is what the write endurance of the new QLC-based SSDs will be. The 5210 ION's endurance rating will be less than that of the 5200 ECO, which is rated for around 1 DWPD in most capacities. Micron indicates that their QLC NAND is good for around 1k Program/Erase cycles, which suggests a limit of at most about 0.5 DWPD before write amplification is taken into account. This is still higher than many consumer SSDs, where 0.3 DWPD is a typical rating for entry-level SATA SSDs with 3D TLC NAND. When used for tasks where the performance of hard drives is currently adequate, the write endurance of the 5210 ION shouldn't be much of a problem. An endurance rating of about 0.1 DWPD would be sufficient for the 5210 ION to handle more random writes over its 5-year warranty than a hard drive can provide, but for sequential workloads it will still be possible to wear out the 5210 by writing to it at hard drive speeds. But Micron isn't recommending the 5210 ION for continuous video recording; instead they are pitching it for workloads that are at least 0% reads. The Micron 5210 ION is now shipping to select customers with capacities from 1.92TB to 7.68TB, and will be broadly available this fall. Exact pricing and specifications will be released at that time. Intel has not yet announced any products using QLC NAND, but we expect product announcements and possibly shipments in time for Flash Memory Summit in August. Intel and Micron are also working on their next generation 3D NAND manufacturing process, which increases the layer count to 96. This will provide a bigger density boost than a switch from TLC to QLC. It appears that development is currently focused on 96L TLC parts of unspecified capacity, but they will surely be followed by 96L QLC parts as well. Beyond 96 layers, Intel and Micron's long-standing partnership in flash memory technology will come to an end, with the two companies developing their flash independently. Neither company has shared any roadmap information going past this split, so it is not clear to what extent their designs will diverge with what will probably be the 128-layer generation.